Marshall quarterback Chase Litton (14) releases a throw during the first half of a Sept. 16 football game against Kent State at Joan C. Edwards Stadium in Huntington, W.Va.
CHARLOTTE, N.C. — A solid start to league play. Visiting Marshall used a stingy defense, a potent ground attack and a pair of Chase Litton to Tyre Brady touchdown passes on Saturday night to claim a 14-3 victory over Charlotte in a Conference USA contest at McColl-Richardson Field in the Tar Heel State. The Thundering Herd (4-1, 1-0 CUSA East) churned out a season-high 212 rushing yards and maintained possession of the ball for 36:37 of the 60-minute affair, but the Green and White needed a pair of aerial strikes to find the scoreboard. Litton found Brady on a 37-yard TD pass with 6:25 left in the first quarter, which gave the guests a 7-0 lead that lasted into halftime. Brady then capped a seven-play, 72-yard drive to open the second half on an 11-yard grab from Litton at the 9:14 mark, giving MU its largest lead of the night at 14-0. Nigel Macauley tacked on a 30-yard field goal for the 49ers (0-6, 0-2) with 5:20 left in the third, which ultimately wrapped up the 11-point outcome. The Thundering Herd claimed a 23-9 edge in first downs and finished the night plus-1 in turnover differential. 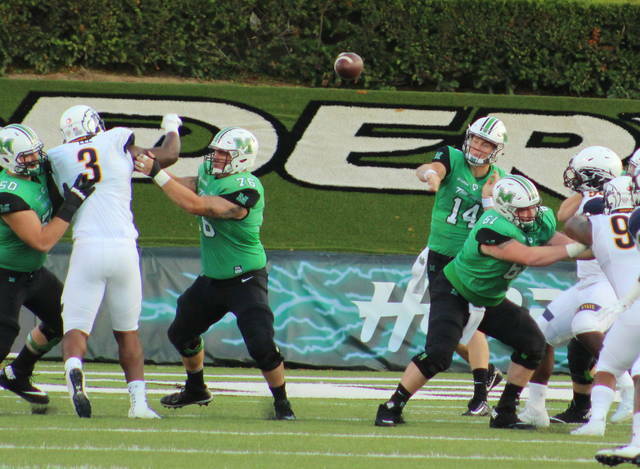 Marshall also claimed a nearly 2-to-1 edge in total yards of offense with a 404-212 overall advanatge. The Herd returns to action at 2:30 p.m. Saturday when it hosts Old Dominion on Homecoming at Joan C. Edwards Stadium. A complete recap of the Marshall at Charlotte contest will be available in Tuesday’s edition of the Point Pleasant Register.